Our team has been dedicated to offering our customers a first class experience for over 30 years, at Cuisine we advise our customers the best materials, space maximising techniques and design ideas; all unique and all to budget. Your dedicated designer will take care of you from quotation to completion. From the moment you receive your first FREE on site consultation you will realise what makes us different. Give us a call and we will find the best way to give you peace of mind with your kitchen project. The Cuisine showroom is a perfect place to discover the latest and trendiest products available on the market for your next dream kitchen. As soon as something new comes out we try it and bring it in the showroom! Two Pack: By far our favourite option for a polished finish. At Cuisine we have our own paint shop. We have many samples available in the showroom or we would be happy to use your own specific colour. Hardware: Blum and Hettich are the hardware brands we prefer to work with. There is a hardware solution to suit any project. Cuisine designers have years of experience dealing with thousands of different pieces of hardware, they will enjoy explaining the differences and the merits of one make over the other. Stone and Solid Surface Bench Tops: The range of colours are endless, the hard part will be to decide which option to choose. Stone options from Caesarstone – Quantum Quartz – Smartstone – Essastone – YDL Stone or Solid surface options from Corian and Staron. Cuisine also offers the opportunity for customers to see full slabs of stone available in our partner stone warehouses. Our lighting display demonstrates just how subtle lighting can play an important and aesthetic part in the design of a kitchen or bathroom. The concealed under cabinet lighting is becoming an integral part of the cabinetry design. Tiny spot lights can be used to great effect in open shelf units highlighting works of art and favourite items. Lighting can be very effective in creating a relaxing ambience. We also have on display some of the latest appliances. The range of modern appliances are endless and we are able to recommend and organize the correct appliances for the job by using our partners in the appliance industry. Book an appointment and let our designer open your eyes to the possibilities. 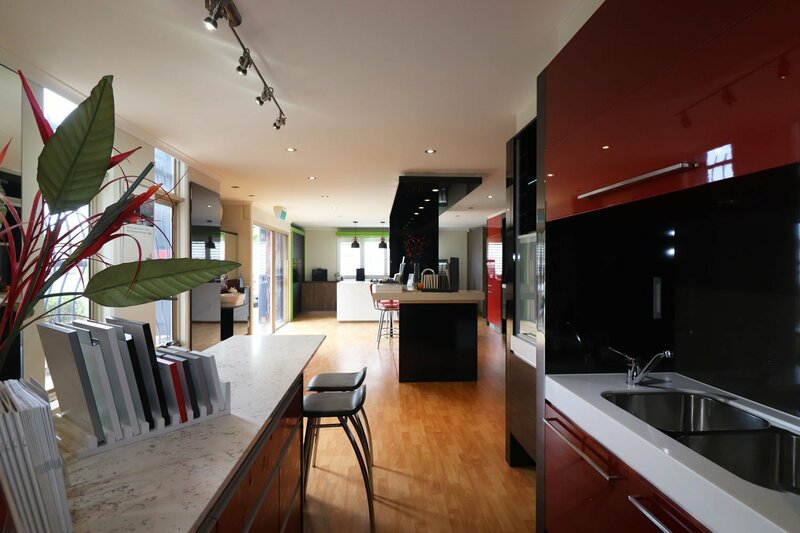 Hard to visualise what your newly designed kitchen will look like? Thanks to our design experience we are confident we can design an impressive layout for your kitchen. Nowadays CAD software is available to show customers what their kitchen will look like even before production. This is part of our designers job to be able to give customers the closest idea of the outcome before production. Cuisine designers use some of the most sophisticated software to create 2D drawings, Live 3D and real rendering before production. We do not start production before customers have a clear idea of their future kitchen. 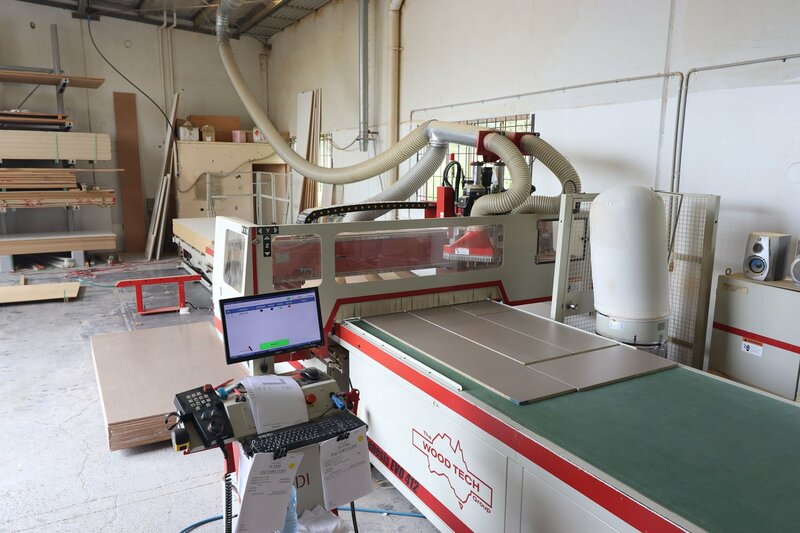 At Cuisine we have invested in some of the latest technology in the joinery industry. Our production offices are linked to our CNC machinery offering precise and accurate results. 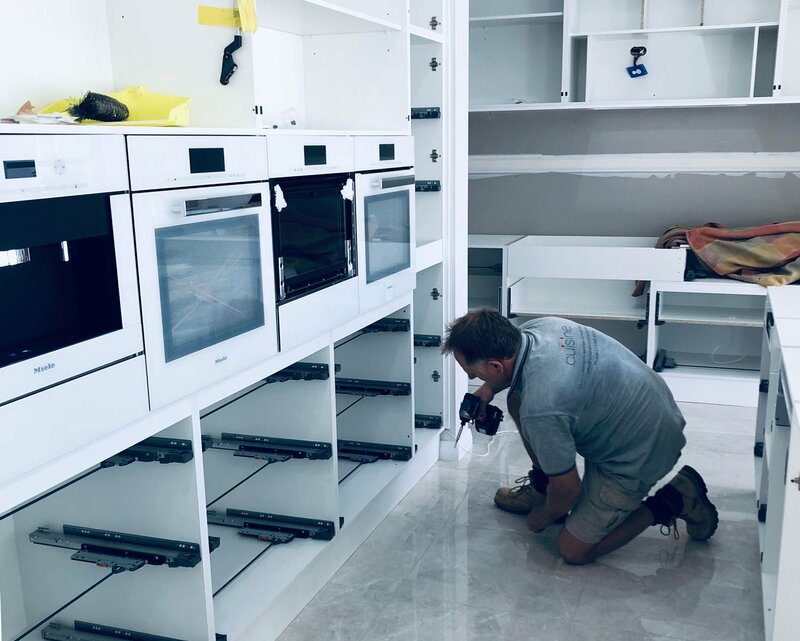 Our experienced staff has a wealth of knowledge of the cabinet making industry and even the most complicated projects can be accommodated in our factory. Because of our advanced technology we are able to cater for one off situations or large volume production runs. Once the planning has been finalized the production begins. Our highly skilled production planners scrutinize the drawings and transpose the layout into a language that the machines understand. The press of a button and the job is transferred to our Anderson CNC cutting machine where automation takes over, finally our machine operator identifies all the parts with product identification labels. Once the job is cut and edged in the appropriate finishing material it is off to the assembly plant. Each assembler performs quality control on every item there by maintaining the Cuisine High Standard. Our fully qualified staff demonstrate the importance of quality finishing procedures. The Cuisine delivery team will pay attention to the logistics of the site before delivery. The joinery is carefully packed and delivered by hand then placed in a mutually agreed location for the install to begin. Cuisine has set very high standards for the installation staff and they in turn recognize the importance of producing a finish that they would be happy to see in their own house. Our team of installers will liase with the clients and the supervisors to ensure that the process reaches a more than satisfactory conclusion. At the conclusion of the installation process the installer will remove any excess material from the site or place any waste in the receptacles provided. Our supervisors will inspect the site and organize a final clean prior to the hand over date.